Packaging Details Height Width Depth Weight 4.45" 2.5" 2.5" 5.12 oz. Details Dietary Supplement. Rapid fat-loss technology. Clinically proven with 7-KETO. Over 1 million sold. Lose fat on the places that matter the most. Research has shown that with age, your metabolic rate drops, along with your energy levels and your ability to burn fat. That's the number one reason trying to get rid of stubborn, unwanted bodyfat, especially on the waist, hips, and thighs, can be so frustrating - making it seem literally impossible to lose weight on those trouble spots, no matter how hard you diet and exercise. But it doesn't have to be that way any longer. 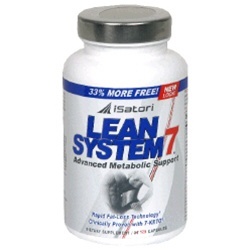 Lean System 7 has been successfully used by over one-million people worldwide and is scientifically designed to help you: » Support a healthy metabolic diet. » Reduce excess water weight. » Preserve muscle tissue. » Target stored bodyfat. Lean System 7 contains a proprietary formula that cannot be duplicated and is manufactured under the strictest pharmaceutical-quality guidelines. The contents of each capsule are analyzed with independent laboratories to ensure the complete, purity, potency, and accuracy of its content. (These statements have not been evaluated by the Food and Drug Administration. This product is not intended to diagnose, treat, cure, or prevent any disease.) Nutrition Facts Serving Size 2 capsules Servings Per Container 60 Amount Per Serving % Daily Value Lean System 7 1,386 mg *percent Daily Values are based on a 2,000 calorie diet. Ingredients: Other Ingredients: Gelatin, Rice Flour, Magnesium Stearate, and Titanium Dioxide. Lean System 7, a Proprietary Blend Containing: Yerba Mate (Llex Paraguariensis) (Leaves), Guarana (Paullinia Cupana) (Seeds), Green Tea (Camellia Sinensis) (Leaves), Dandelion (Taraxacum Officinale) (Leaf and Root), Advantra Z (Supplying Citrus Aurantium Extract [10% Synephrine Alkaloids]), N-Methyltyramine, Hordenine, Octopamine & Tyramine), 7-Keto (3-Acetyl-7-Oxo-Dehydroepiandrosterone), Bioperine (Piper Nigrum) (Fruit). *These statements have not been evaluated by the Food and Drug Administration. This product is not intended to diagnose, treat, cure or prevent any disease. Directions Recommended Use: As a dietary supplement, take 2 capsules with a full glass of water, 2 to 3 times per day, 30 minutes prior to meals and/or exercise. Do not exceed 6 capsules per day. Begin use with one-half the recommended dose for the first week (one capsule 2 to 3 times per day).